Having a command authority is one requirement for combatant status under the laws of war, though this authority need not have obtained an official commission or warrant. In such case, those persons holding offices of responsibility within the organization are deemed to be the officers, and the presence of these officers connotes a level of organization sufficient to designate a group as being combatant. Commissioned officers generally receive training as leadership and management generalists, in addition to training relating to their specific military occupational specialty or function in the military. Many advanced militaries require university degrees as a prerequisite for commissioning, even from the enlisted ranks. Others, including the Australian Defence Force, the British Armed Forces (BAF), Nepal Army, the Pakistani Armed Forces (PAF), the Swiss Armed Forces, the Singapore Armed Forces, the Israel Defense Forces (IDF), the Swedish Armed Forces, and the New Zealand Defence Force, are different in not requiring a university degree for commissioning—although a significant number of officers in these countries are graduates. In the Israel Defense Forces, a university degree is a requirement for an officer to advance to the rank of lieutenant colonel. The IDF often sponsors the studies for its majors, while aircrew and naval officers obtain academic degrees as a part of their training programmes. In the United Kingdom, there are three routes of entry for British Armed Forces officers. The first, and primary route are those who receive their commission directly into the officer grades following completion at their relevant military academy. In the second method, an individual may gain their commission after first enlisting and serving in the junior ranks, and typically reaching one of the senior non-commissioned officer ranks (which start at sergeant (Sgt), and above), as what are known as 'direct entry' or DE officers (and are typically and informally known as an 'ex-ranker'). The third route is similar to the second, in that they convert from an enlisted to a commission; but these are only taken from the highest ranks of SNCOs, and are known as 'late entry' or LE officers. LE officers, whilst holding the same Queen's commission, generally work in different roles from the DE officers. In the infantry, a number of warrant officer class 1s are commissioned as LE officers. In the British Army, commissioning for DE officers occurs after a 44-week course at the Royal Military Academy Sandhurst for regular officers or the Army Reserve Commissioning Course, which consists of four two-week modules (A-D) for Army Reserve officers. The first two modules may be undertaken over a year for each module at an Officers' Training Corps, the last two must be undertaken at Sandhurst. 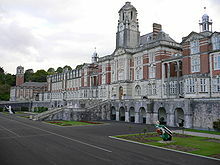 For Royal Navy and Royal Air Force officer candidates, a 30-week period at Britannia Royal Naval College or a 24-week period at RAF College Cranwell, respectively. Royal Marines officers receive their training in the Command Wing of the Commando Training Centre Royal Marines during a gruelling 15-month course. The courses consist of not only tactical and combat training, but also leadership, management, etiquette, and international affairs training. Until the Cardwell Reforms of 1871, commissions in the British Army were purchased by officers. The Royal Navy, however, operated on a more meritocratic, or at least socially mobile, basis. Commissioned officers are typically the only persons, in an armed forces environment, able to act as the commanding officer (according to the most technical definition of the word) of a military unit. A superior officer is an officer with a higher rank than another officer, who is a subordinate officer relative to the superior. Non-commissioned officers (NCOs), to include naval and coast guard petty officers and chief petty officers, in positions of authority can be said to have control or charge rather than command per se (although the word "command" is often used unofficially to describe any use of authority). Graduates of the United States service academies attend their institutions for no less than four years and, with the exception of the USMMA, are granted active-duty commissions immediately upon completion of their training. They make up approximately 20% of the U.S. armed forces officer corps. ROTC is composed of small training programs at several hundred American colleges and universities. There is no Marine Corps ROTC program per se, but there exists a Marine Corps Option for selected midshipmen in the Naval ROTC programs at civilian colleges and universities or at non-Federal military colleges such as The Citadel and the Virginia Military Institute. A smaller number of officers may be commissioned via other programs, such as the Marine Corps Platoon Leaders Class (PLC) during summers while attending college. PLC is a sub-element of Marine Corps OCS and college and university students enrolled in PLC undergo military training at Marine Corps Officer Candidate School in two segments: the first of six weeks between their sophomore and junior year and the second of seven weeks between their junior and senior year. There is no routine military training during the academic year for PLC students as is the case for ROTC cadets and midshipmen, but PLC students are routinely visited and their physical fitness periodically tested by Marine Corps Officer Selection Officers (OSOs) from the nearest Marine Corps officer recruiting activity. PLC students are placed in one of three general tracks: PLC-Air for prospective Marine Naval Aviators and Marine Naval Flight Officers; PLC-Ground for prospective Marine infantry, armor, artillery and combat support officers; and PLC-Law, for prospective Marine Corps judge advocate general officers. Upon graduation from college, PLC students are commissioned as active duty 2nd Lieutenants in the US Marine Corps Reserve, with the option to augment their commissions to the Regular Marine Corps after five to ten years of commissioned service. In addition to ROTC, Army National Guard (ARNG) officers may also be commissioned through state-based Officer Candidate Schools. These schools train and commission college graduates, prior-servicemembers, and enlisted Guard soldiers specifically for the National Guard. In the United States Armed Forces, officers without a four-year university degree at the bachelor's level can, under certain circumstances, also be commissioned. In the Navy, Marine Corps and Coast Guard, these are typically the officers in the Limited Duty Officer (LDO) and Chief Warrant Officer (CWO) programs. Officers in this category constitute less than 2% of all officers. The Air Force, in contrast, now requires all commissioned officers, regardless of background or enlisted rank, to possess a minimum of a bachelor's degree prior to commissioning. Direct commission is another route to becoming a commissioned officer. Credentialed civilian professionals such as scientists, pharmacists, physicians, nurses, clergy, and attorneys are directly commissioned upon entry into the military or another federal uniformed service. However, these officers generally do not exercise command authority outside of their specific branches (e.g., U.S. Army Medical Corps; U.S. Navy Judge Advocate General's Corps, etc.). In the past (World War II), industrial management expert civilians were also direct-commissioned to stand up materiel production for the Armed Forces. Although significantly represented in the retired senior commissioned officer ranks of the US Navy, a much smaller cohort of current active duty and active Reserve officers (all of the latter being Captains or Flag Officers as of 2017) were commissioned via the Navy's since discontinued Aviation Officer Candidate School (AOCS) program for college graduates. AOCS focused on producing line officers for Naval Aviation who would become Naval Aviators and Naval Flight Officers upon completion of flight training, followed by a smaller cohort who would become Naval Air Intelligence Officers and Aviation Maintenance Duty Officers. Designated as Aviation Officer Candidates (AOCs), individuals in the AOCS program were primarily non-prior military service college graduates, augmented by a smaller cohort of college-degreed Active Duty, Reserve or former enlisted personnel. In the late 1970s, a number of Air Force ROTC graduates who had lost their flight training slots prior to going on active duty due to a post-Vietnam Reduction in Force (RIF) resigned their inactive USAF commissions and also attended AOCS for follow-on naval flight training. AOCs were active duty personnel in pay grade E-5 (unless having held a higher Active Duty or Reserve enlisted grade) for the duration of their 14-week program. Upon graduation, they were commissioned as Ensigns in the then-US Naval Reserve on Active Duty, with the option to augment their commissions to the Regular Navy after 4 to 6 years of commissioned service. Another discontinued commissioning program is the Air Force's Aviation Cadet program. Originally created by the US Army Signal Corps in 1907 to train pilots for its then-fledgling aviation program, it was later used by the subsequent US Army Air Service, US Army Air Corps and US Army Air Forces to train pilots, navigators, bombardiers and observers through World War I, the interwar period, World War II, and the immediate postwar period between September 1945 and September 1947. With the establishment of the US Air Force as an independent service in September 1947, it then became a source for USAF pilots and navigators. Cadets had to be between the ages of 19 and 25 and possess either at least two years of college/university level education or three years of a scientific or technical education. In its final iteration, cadets received the pay of enlisted pay grade E-5 and were required to complete all pre-commissioning training and flight training before receiving their wings as pilots or navigators and their commissions as 2nd Lieutenants on active duty in the US Air Force Reserve on the same day. Aviation cadets were later offered the opportunity to apply for a commission in the Regular Air Force and attend a college or university to complete a 4-year degree. As the Air Force's AFROTC and OTS programs began to grow, and with the Air Force's desire for a 100% college-degreed officer corps, the Aviation Cadet program was slowly phased out. The last Aviation Cadet Pilot graduated in October 1961 and the last Aviation Cadet Navigators in 1965. By the 1990s, the last of these officers had retired from the active duty Regular Air Force, the Air Force Reserve and the Air National Guard. In countries whose ranking systems are based upon the models of the British Armed Forces (BAF), officers from the rank of Second Lieutenant (army), Sub-Lieutenant (navy) or Pilot Officer (air force) to the rank of General, Admiral or Air Chief Marshal respectively, are holders of a commission granted to them by the appropriate awarding authority. In United Kingdom (UK) and other Commonwealth realms, the awarding authority is the monarch (or a Governor General representing the monarch) as head of state. The head of state often is granted the power to award commissions, or has commissions awarded in his or her name. In Commonwealth nations, commissioned officers are given commissioning scrolls (also known as commissioning scripts) signed by the Sovereign or the Governor General acting on the monarch's behalf. Upon receipt, this is an official legal document that binds the mentioned officer to the commitment stated on the scroll. In some branches of many armed forces, there exists a third grade of officer known as a warrant officer. In the armed forces of the United States, warrant officers are initially appointed by the Secretary of the service and then commissioned by the President of the United States upon promotion to chief warrant officer. In many other countries (as in the armed forces of the Commonwealth nations), warrant officers often fill the role of very senior non-commissioned officers. Their position is affirmed by warrant from the bureaucracy directing the force—for example, the position of regimental sergeant major in regiments of the British Army is held by a warrant officer appointed by the British government. In the U.S. military, a warrant officer is a technically-focused subject matter expert, such as helicopter pilot or information technology specialist. There are no warrant officers in the U.S. Air Force; the last warrant officers retired in the 1980s, and ranks became dormant. All other U.S. Armed Forces have warrant officers, with warrant accession programs unique to each individual service's needs. Although Warrant Officers normally have more years in service than regular commissioned officers, they are below regular commissioned officers in the rank hierarchy. In certain instances, commissioned chief warrant officers can command units. In most maritime forces (navies and coast guards), the NCO ranks are called petty officers while enlisted ranks prior to attaining NCO/petty officer status typically known as seaman, or some derivation thereof. In most traditional infantry, marine and air forces, the NCO ranks are known as sergeants and corporals, with non-NCO enlisted ranks referred to as privates and airmen. Officers in nearly every country of the world are segregated from the enlisted soldiers, sailors, airmen, marines and coast guardsmen in many facets of military life. Facilities accommodating needs such as messing (i.e., mess hall or mess deck versus officers mess or wardroom), separate billeting/berthing, domiciles, and general recreation facilities (officer clubs versus NCO Clubs and CPO Clubs versus enlisted clubs) are separated between officers and enlisted personnel. This class system, historically correlated to socioeconomic status, is focused on discouraging fraternization and encouraging professional and ethical relations between officers and enlisted military personnel. Officers do not routinely perform physical labor; they typically supervise enlisted personnel doing so, either directly or via non-commissioned officers. Commissioned officers will and do perform physical labor when operationally required to do so, e.g., in combat. However, it would be very unusual for an officer to perform physical labor in garrison, at home station or in homeport. Article 49 of the Third Geneva Convention stipulates that even as prisoners of war, comissioned officers cannot be compelled to work, and NCOs can only be given supervisory work. ^ a b "UK Armed Forces Annual Personnel Report" (PDF). Ministry of Defence. 1 April 2013. Retrieved 25 December 2015. ^ "Défense : Jean-Yves Le Drian supprime 580 postes d'officiers de l'armée française en 2013". Latribune.fr. Retrieved 20 August 2017. ^ Pike, John. "Germany - Military Personnel". Globalsecurity.org. Retrieved 20 August 2017. ^ "2012 Demographics Report" (PDF). Militaryonesource.mil. Retrieved 20 August 2017. ^ "Practice Relating to Rule 4. Definition of Armed Forces". International Committee of the Red Cross. Retrieved 5 July 2018. ^ "10 U.S.C. § 101". US Congress. 5 January 2009. ^ "Leatherneck: Citadel "Double Dogs"" (PDF). Citadelsanantonio.org. Marine Corps Association. Archived from the original (PDF) on 12 August 2015. Retrieved 13 November 2015. ^ "Direct Commission Selected School (DCSS) Program". Gocoastguard.com/. U. S. Coast Guard. Retrieved 17 November 2015. ^ "Officer Candidate School (OCS)". Gocoastguard.com. Retrieved 20 August 2017. 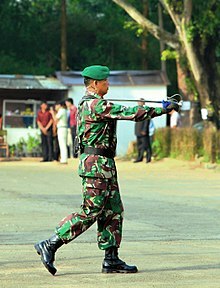 Wikimedia Commons has media related to Military officers.